We are now over two and a half months deep into Magento Solution Specialist certification that rolled out during this year’s Imagine eCommerce conference. 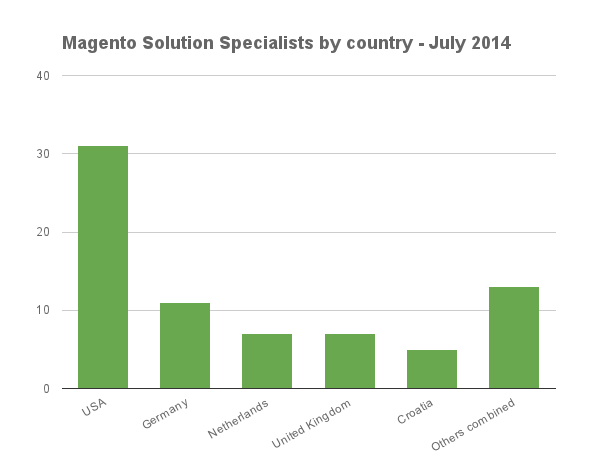 So, it was about time to crunch some numbers – we bring you the first “State of Magento Solution Specialist Certification” report. Who leads the charts with Solution Specialist certification? Which continent, country, city and solution partner have the most people certified? 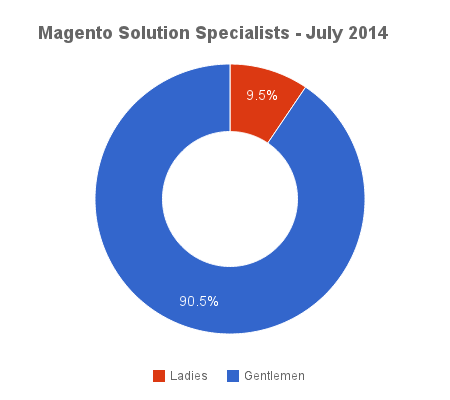 These and some other interesting stats can be drawn from the current list of certified solution specialists available from the official Magento certification directory. 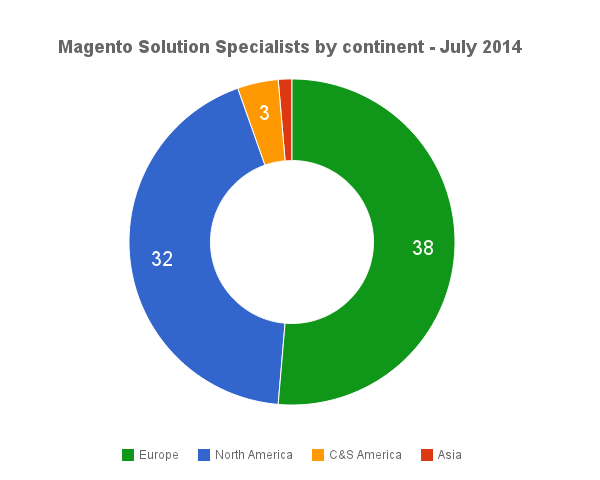 Let’s start with some basics – there are 74 Magento Certified Solution Specialists worldwide at the time of writing this article (end of July 2014). I’m happy to report that Europe actually leads the way in front of North America with 38:32 and only a handful of Solution Specialists coming from other continents (Central and South America with 3 and Asia with 1). However, USA does lead the charts in the total number of MCSS per country with the total of 31, followed by Germany with 11, Netherlands and UK with 7 apiece and yours truly – Croatia with 5. Our hometown of Osijek can take the global bragging rights on city level for the time being with 5 MCSS badges shining right here in Croatia with some “smaller places” like Groningen (Netherlands), Springfield (MO, USA) and New York following suit with 4 each. And if you were wondering how come some of these cities take the reins, here’s a quick explanation – our Classy Llama friends come from Springfield, Missouri and Inchoo, as you probably already know, is based in Osijek, Croatia. Our two companies are currently tied for the lead with 4 Solution Specialists each. Interestingly enough, this is the only certificate for the majority of those who attained it, 45 people didn’t have any other Magento certificate (myself included) prior to this one – and it makes perfect sense, as Magento clearly announced this to be the first non-technical certification.That meant that many of us who were around the platform and know it reasonably well simply didn’t have the opportunity to verify this – now we were quick to jump on the bandwagon. Who’s your MVD (Most Versatile Developer)? There are some all-rounders in the mix, what you might call your Most Versatile Developers – I found 5 (five) people on the listing that have passed all currently available Magento certification exams – Frontend, Backend, Backend Plus and Solution Specialist achieving a Magento Certification Grand Slam – talk about wearing multiple hats, right? And if we dig a little deeper, there are two people named Eric and one Erik on the list making this name the most common one in the Solution Specialists pool – not sure what you want to do with this particular piece of information, but here it is. Women also play a part, albeit theirs is more of a supporting role as there’s the total of 7 Solution Specialist ladies out there (slightly below 10%) – and all of them come from USA – so what’s up with that, Europe?! And there you go – State of Magento Solution Specialist certification at the end of July 2014 – I plan to prepare updates and show some more interesting data in the months to come, so stay tuned. There is also a possibility that not all people who got certified made their profiles public, so the actual number of certified developers may be a bit higher. How many Magento certified people do you know? Great post Inchooers. You have a wonderful team. Greetins from Mar del Plata, Argentina. I passed the exam two weeks ago. I have not yet been published. This always takes some time – as I know from every certification in our company. From my point of view one cant do data mining with bad data. But speaking of “Searchable Profiles” its a very interesting post. Thank you for that! Now, I’ve looked you up and your profile is public but only shows the developer cert badge, is the MCSS certification new? When did you pass the exam? Due to the fact that you can “make my Profile Searchable in Certification Directory” numbers can differ. But i really want to believe I am 1 out of 11 MCSS, so i guess its ok.